Video clip synopsis – Shane Bolt was one of 281 children airlifted out of Saigon in April 1975 at the end of the Vietnam War and brought to Australia. He was adopted by a Western Australian family. 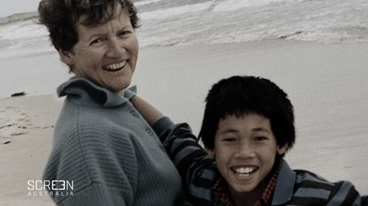 Shane’s Australian mother, Frea, remembers how the family fought anti-Asian sentiment in Perth. Broadband MP4 intercountry_bb.mp4 (3.7MB), suitable for iPods and computer downloads. This film clip shows Shane contemplating a stunning ocean sunset at Yallingup beach, Western Australia. As he drinks a beer he reflects that ‘destiny is destiny’. He says he ‘was dealt a good hand’, that he is happy and has a great family whom he ‘loves heaps’. Thea discusses the difference between the ideal world where adoption is second best, and argues that the next best thing is for such children displaced by war to have a family who loves them. Family photos are included in this clip. Intercountry adoption and cultural identity is an excerpt from the documentary Operation Babylift produced in 2003. A Film Australia National Interest Program. Produced in association with SBS Independent. As Shane prepares squid for the family barbecue, he recounts the factors that account for his happy childhood in Australia. What are four of these factors? Shane mentions the family ‘philosophy’. What does he mean by this word? Does your family operate by a philosophy or belief system? If so, what is it? Is it effective or helpful? Shane’s adoptive mother explains that there was a distressing wave of anti-Asian graffiti and posters around Perth in the 1970s when Shane and his siblings were small. What did the family do about this? Research evidence of this period of racism in Australia. The family could have ignored the anti-Asian campaign. Would it have been ethical to ignore such a campaign? Do you think Shane and his siblings would have learnt anything from their parents’ problem-solving strategy? How does Shane look back on it now? Should adoptive parents encourage their intercountry children to have social and cultural connections with local communities whose origins are from the same country? Draw up a list of positive outcomes that this may provide. What programs exist today for the support, transition or repatriation of children who find themselves displaced in Australia due to conflict in their own country? Think about children from East Timor, Iraq and Afghanistan in particular, given that Australian troops have had a presence in these countries during the troubles of recent decades. What other programs would you advise? How much responsibility should Australia acknowledge and take on, even many years after involvement in conflict overseas? Research where communities of Vietnamese people have settled in Australia. Draw up map of your city or town and pin point the locations of significant communities of Vietnamese business. What contribution do these communities provide for Australia? Complete the existing narrative in Kahootz by adding two more scenes to illustrate the family’s life in Australia now. The novel, Boy Overboard by Morris Gleitzmann, may provide inspiration to developing your storyline.